Sale Prices on Sets! Tested and proven fabrics! Cost effective relief for those with asthma or nightime allergy symptoms! The favorite home for dust mites is your bed and pillow. Most people are allergic to dust mite feces. The first step in any allergen avoidance program is to encase pillows and beds in dust mite proof covers. Unlike the old plastic covers, the new materials are comfortable, breathable and quiet. Ours come in three different fabrics from a durable vinyl (for box springs) to the luxurious Premier 100% Cotton Comfort Plus. Just zip them up and enjoy 100% impermeable protection. We have packaged our encasements in convenient and money-saving sets. Twin and long twin come with mattress encasement, box springs encasement and one pillow encasement. Full, Queen and King come with 2 pillow encasements. Premier sets have Premier mattress and pillow encasements and vinyl box spring covers. Economy sets have Cotton Blend mattress and pillow encasements and vinyl box spring covers. Premier 100% Cotton Comfort Plus Dust Mite Proof Mattress Covers - A comfortable, cool and quiet solution to allergy bedding! This special high-tech fabric gives tested and proven protection without a liner. Each fiber in the Premier material is shaped like a mat. When you weave these mats together, you create a fabric that is luxurious, cool, quiet and can withstand numerous washings without losing its effectiveness. Gone are the days when allergen encasements were noisy and hot. Premier fabric feels like a nice 100% cotton sheet. Yet it does the job of protecting you from the allergen soup in your bed. The pores in the Premier fabric go down to 3 microns - well below the size of all common allergens including dander, dust mite, mold and pollens. Can be washed in hot water. 5-year warranty. 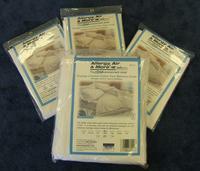 Premier 100% Cotton Comfort Plus Dust Mite Proof Pillow Covers - The first step in allergy relief! Some people balk at the cost of dust mite proof encasements for their mattresses and pillows. Will it work? Is it worth the expense? We have worked with literally thousands of people one on one in our Allergy, Air and More stores over the past 19 years. Our fabrics are tested and proven. The pore size is tested down to 3 microns - small enough to capture even cat dander. But the easiest and best way to tell whether the encasements will be effective for you is to purchase the pillow encasements for all of the pillows that are used on the bed. No need to cover the decorative pillows. Then wash everything on the bed including sheets, pillow cases, blankets and bedspreads in hot water or use one of our special anti-allergen laundry detergents. Most people will notice an immediate improvement in their allergy symptoms. Then it is easy to justify the expense of the mattress encasements.The Premier pillow encasements are luxurious, cool and can withstand prolonged use and numerous washings without losing their effectiveness. Just zip them up and enjoy 100% impermeable protection. Our Cotton Blend encasings offer a cool, comfortable cloth outside, and a breathable, urethane dust mite barrier on the inside. These encasements have a "percale cotton" feel - none of that plastic noise or discomfort of the old style coverings. Not quite as breathable or luxurious as the Premier products but definitely an economical, long-lasting product providing excellent protection. My wife and I have used ours for 9 years and they are still working great. You can't go wrong for this price. Made in USA. Our Cotton Blend encasings offer a cool, comfortable cloth outside, and a breathable, urethane dust mite barrier on the inside. Made in USA. Satin Sure Dust Mite Mattress Encasements - Soft, economical and durable! Our Satin Sure mattress encasments have a soft, silky feel with a breathable, polyeurethane barrier on the inside for a comfortable sleep. The Satin Sure encasements are made of a stretch polyester fabric that makes it a popular as well as very economical choice. A cost effective solution for 100% dust mite protection. Satin Sure Dust Mite Pillow Encasing - An effective dust mite cover that is silky and soft! The Satin Sure pillow cover offers a silky feel with the protection from a unique polyurethane membrane that not only prevents dust mite allergens from becoming airborn, but is breathble for a more comfortable night's sleep. A comfortable pillow cover that will protect you from the dust mites. Premier Comfort Plus Dust Mite Proof Comforter Covers - Cool and comfortable allergy protection! Comfortable, cool fabric allows you to use your comforter without irritating dust mite exposure. Satin Sure Dust Mite Proof Comforter Covers - Soft, economical and durable! Box Spring/Mattress Protector - Tough 6 mil vinyl! Box spring or mattress encasing made from strong 6-guage vinyl. All vinyl box spring and mattress encasings need no washing - wipe with a damp cloth twice a month.